As a 501(c)(3), nonprofit organization, the Devon Horse Show and Country Fair Foundation relies on your support to make improvements necessary to ensure its position as one of the premier equestrian event facilities in the country and maintain the classic charm of the Country Fair. The Foundation is organized and operated to perform the charitable and educational purposes of the Devon Horse Show and Country Fair, Inc.
New Footing in the Dixon Oval, Wheeler Ring and Schooling Area. Complete restoration of the barns along Dorset and Berkley Roads. New Tea Cart, Pavilion, Picnic Grove, Souvenir and Candy booths in the Country Fair. Increased and improved handicapped seating. Construction of a new Hospitality Complex. Restoration of the Main, South and East Grandstands. Remodel of Horse Show Office and Committee Stand. Redesign of Country Fair food booths. Complete the Barn Restoration Project, including the barns along Valley Forge Road. 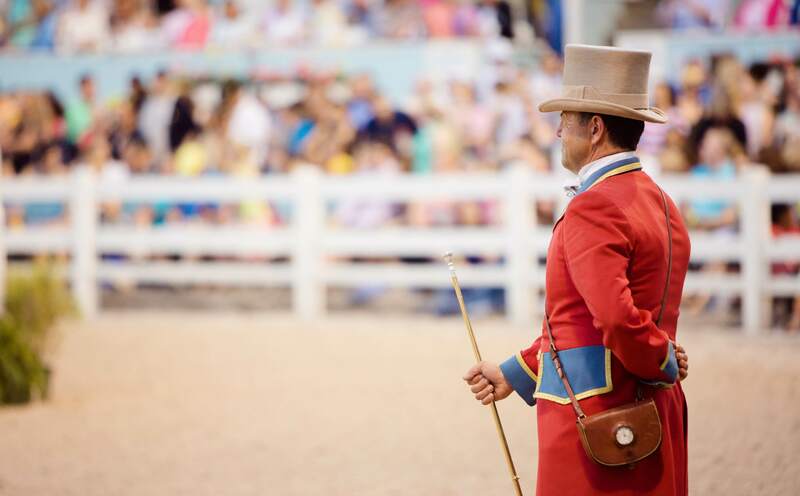 There are many opportunities available for those who wish to participate, and with much work to yet be completed, we are asking you to consider making a tax deductible donation to the Devon Horse Show & Country Fair Foundation. Gifts may be made by mail or online. If you would like to make a gift by transfer of securities, please contact Paul Saylor, Financial Director, at 610-964-0550 ext. 217 or email paul@devonhorseshow.org. The Devon Horse Show and Country Fair Foundation is grateful to the many donors who have given generously to our organization. These donations support our grounds and our organization so that we may continue to be one of the top Horse Shows in the country as well as the longest running outdoor multi-breed show. As we celebrate our 122nd anniversary, join us in continuing the Devon tradition for years to come. 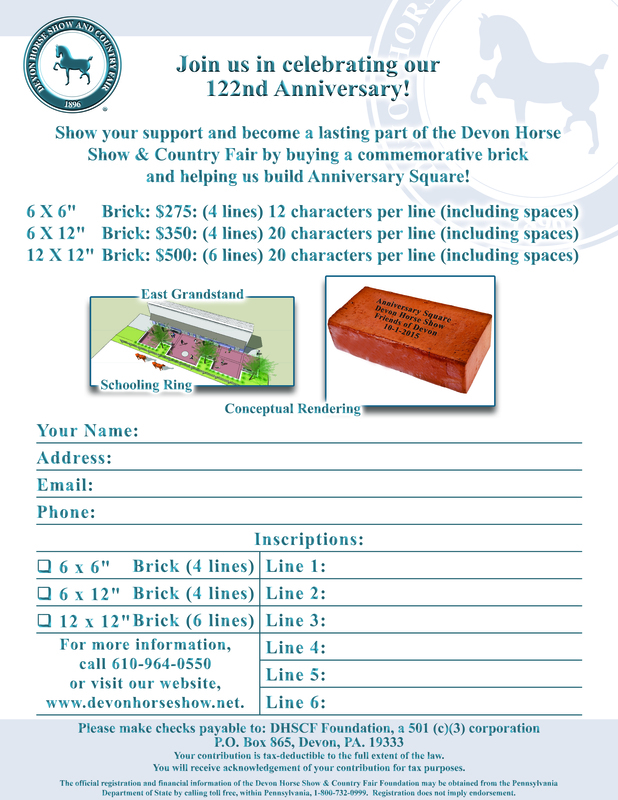 Purchase a commemorative brick for Anniversary Square to honor your family, horse, barn, or simply to express your support for the Devon Horse Show & Country Fair! The Square was launched at the 2016 spring show — we look forward to celebrating the next 122 years at Devon! 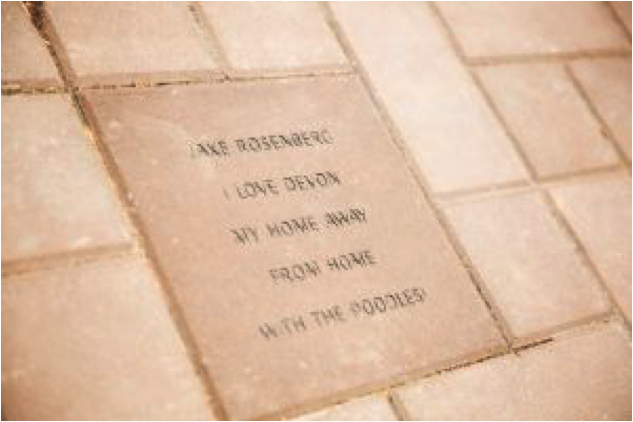 Purchase a Devon horse shoe engraved with your horse’s name that will be proudly displayed on our Wall of Honor for ten years. Your support will be a vital part of the restoration program for the Devon Back Barns. Upgrading the stalls will enhance your horse’s experience at Devon.